Were There Any Stickyback Photographers Beyond the UK? In the information below we have tried to identify stickyback photographers outside England, Ireland, Scotland and Wales, partly from information gleaned from local newspapers. But many of these photographers would not have used newspapers to advertise, preferring instead to advertise extensively at their premises. Others will not have advertised and may only become known through surviving examples of their work. Survivals of sticky back photos are not that common due mainly to their small size and confusion with later photo booth images. This is a work in progress and much more awaits discovery - we welcome any additional information on "Sticky Backs" which you may come across. References: 1902, Isle of Man directories recorded Grossi's American Card & Photo Co. at 10 Castle Mona Shops and Douglas Head. www.isle-of-man.com/manxnotebook/tourism/pgrphrs/pgrhrs.htm. See our pages on Sticky Backs and on Spiridione Grossi for the connection between the Isle of Man and the origin of the name "Stickyback". References: The photograph below is almost certainly a stickyback, found in a card mount 31/2 by 2 5/8 inches with oval cut out bearing the words "The Peveril and Regent Studios". What follows is at the moment a working hypothesis only. The only place where the name "Peveril Studio" has been found in on the Isle of Man, where there was a Peveril Studio on Victoria Pier, operated by William Cottier Cubbin. Cubbin was a photographer in Liverpool at 62A Bold Street 1903-4 and at 175a London Road 1895-1913. He later became a theatrical manager. (Lancashire Professional Photographers 1840-1940 by Gillian Jones and Isle of Man photographers http://www.isle-of-man.com/manxnotebook/tourism/pgrphrs/pgrhrs.htm.) A photograph in an identical mount can be found in the Manchester Regiment Archives, which suggests that this firm was located somewhere in the NW. We were delighted to hear from Priscilla Cox in Tasmania, who recently found the mounted Stickybacks photograph shown below abandoned in the loft of her house. The house dates back to the 1820s. The photo measures 1 1/8” x 1 1/8” and the mount, with brown stars, measures 2 1/2” x 3”. 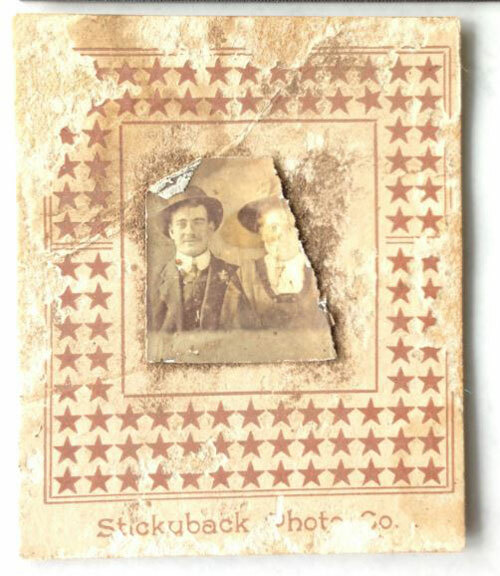 The mount has the name "Stickyback Photo Co" printed on the face. This precise company name has not been found on UK advertisements. Priscilla believes this was taken in Tasmania rather than the UK and has found a number of newspaper advertisements for a travelling stickyback photographer in Tasmania. The North West Post 24 Aug 1910 p2 states "Stickyback Photos - The Stickyback Company announces that their Devonport season is drawing to a close. the privilege of securing 16 photos for 1 shilling has been largely availed of and samples of their photos taken in Devonport are now on view at Messrs G and A Ellis, Ulverstone, which will be the next town visited." The North Western Advocate and the Emu Bay Times 30/8/1910 p2 reported "Stickyback photos have been all the rage for the last few weeks. The studio closes in a few days time". 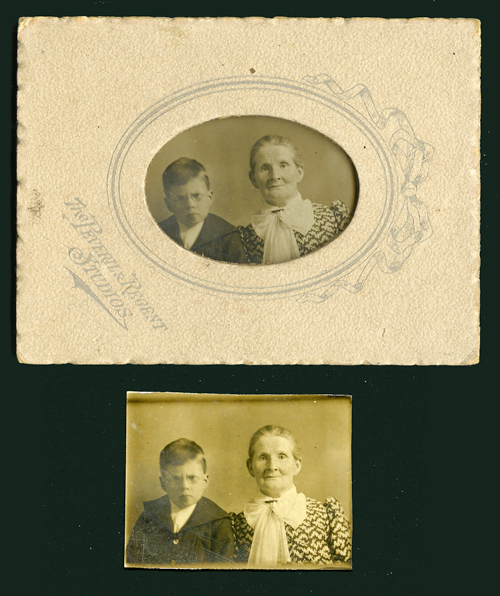 The French photos below appear to be of a similar type to the Stickyback - the uncut multiples clearly depict the same image, rather than the changing poses in a strip of photobooth portraits. The images have a plain background and an information strip shows the photographer's details and a job number. Sizes are not dissimilar to Stickybacks photos. The Stickybacks name does not appear, but clearly the concept travelled to the Continent. British Journal of photography June 16 1911 p466. See our page on photographer and inventor Spiridione Grossi, who had a business in Brussells which may have been a stickyback studio - as yet details unknown. In one of his French patents, Spiridione jointly applied with Belgian, Alfred Lachmann, who may, or may not have been part of Spiridione's business in Belgium.